Air conditioning is an essential element in all commercial and industrial buildings. In most commercial AC units, chilled water is the primary refrigerant used. Air will pass through a coil which contains the chilled water and transfer its heat to the cool water. This water is re-circulated through your AC unit to keep your interiors sufficiently cooled. The chillers used in the Niagara region in heating and air conditioning systems are either water or air-cooled. Water-cooled chillers are placed inside buildings and water will be recycled to an external cooling appliance like a cooling tower or heat sink. Air-cooled chillers, on the other hand, are located outside and have condenser coils containing water, which will be cooled using fan-driven air. Mechanical refrigeration chillers are the common ones used nowadays in chillers. They use compressors to pump water to air handling units where it cools the air in circulation. 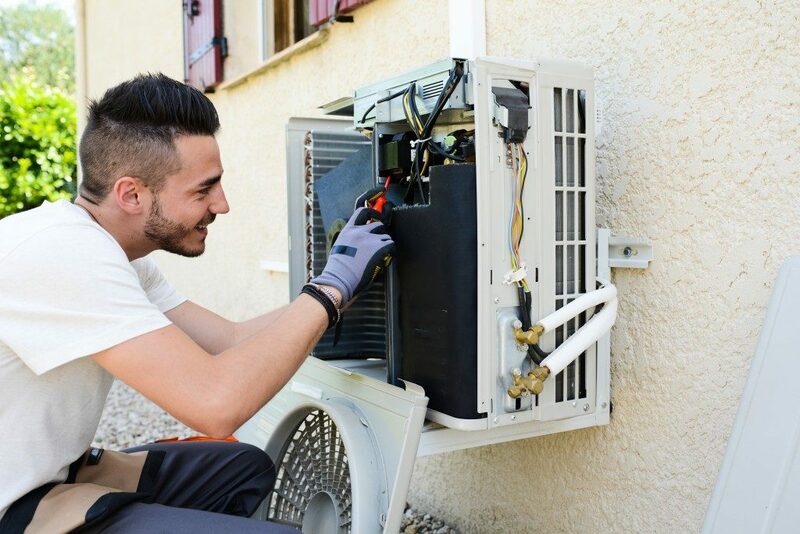 The following are your available options for mechanical chiller compressors when picking an air conditioning unit for a commercial building. These are generally found in air-cooled systems though they can also be used in water-cooled systems with capacities ranging from 10–200 tons. Reciprocating chillers are usually available in 70–1,700 kW and 5–500 TR. Their COP is 4.2–5.5 and they use a chamber and piston for the compression of the refrigerant. You can control the capacity of reciprocating chillers through cylinder unloading, speed control, and compressor staging. These are primarily used in water-cooled systems through a few air-cooled systems have them. Scroll chillers require less maintenance compared to reciprocating chillers and are available in 140–1,400 kW for chillers with capacities of 20–500 tons. In air-cooled units, their COP is 3.2–4.86 while a COP of 4.45–6.2 is the common one in water-cooled units. You can control the capacity of your scroll chiller by separating the scrolls using electronic modulation and a solenoid valve temporarily. Rotary screw compressors work in chillers with 70–500-ton capacities and use interlocking rotating helical rotors for the compression of a refrigerant. They will suffice for both water and air-cooled chillers and have a 70–600TR and 250-2,100 kW. In air-cooled chillers, the screw compressors used have a COP of 2.9–4.15 while in water-cooled chillers, their COP is 4.7–6.07. In general, a water-cooled chiller will only need one compressor while an air-cooled chiller will use two. The capacity of a screw compressor is controlled via a slider or speed control. These suffice for chillers with capacities of 100–7,000 tons. Considered the most efficient compressors for large water-cooled chillers. They are available in 530–21,000 kW and 15–6,000 TR. Their COP is 5.8–7.1, and they use a rotating impeller for the compression of a refrigerant through a chiller. The capacity of a centrifugal compressor can be controlled using vane and speed control guides. Other than these mechanical chiller compressors, you can opt for absorption chillers for your AC unit. These will use an absorption cycle rather than compressors to transfer cooled water to your air handling unit for air cooling. The mechanical chillers have however been proven to be more efficient at air cooling in large buildings than the absorption chillers.